You may just be starting the blog hop or may have come from #23, Brian King at Stamp with Brian on the Pals Hop. If you get off track at any time, the full lineup below will help you move along from blog to blog. Be sure to hop all the way through so you see all of the amazing creations displayed just for you by the talented Pals. Sale-A-Bration - Let It Go! Easier said than done having spent the past months playing with the wonderful Sale-A-Bration products. When considering a project for this month's blog, I scanned my work area looking for ideas when my eyes landed on my left over Sale-A-Bration flyers - BINGO!! - I've got it! If you look closely at the card, you'll see some images you may recognize from the Sale-A-Bration flyer. I used a variety of circle punches to strategically crop photos from the flyer. 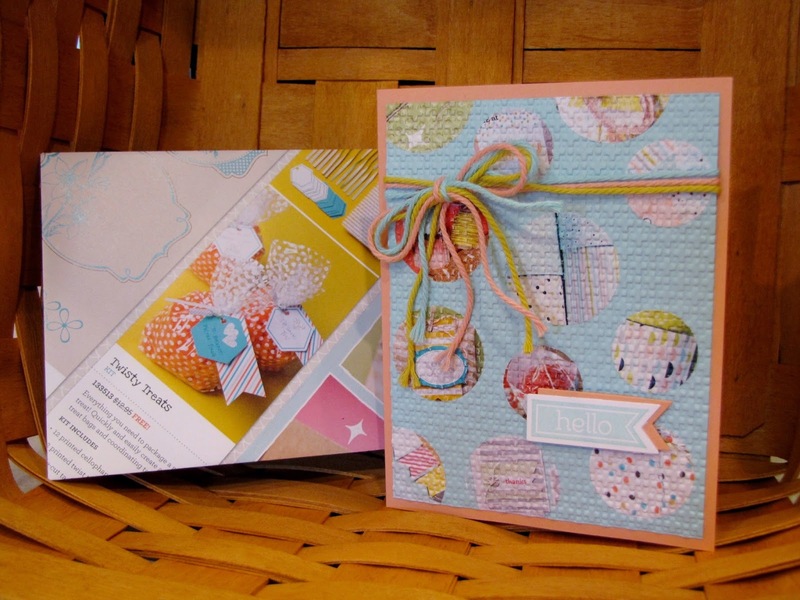 I adhered them to a piece of Pool Party card stock and ran it through the Big Shot using the Lattice embossing folder. The colored twine, a Sale-A-Bration left over, picked up the colors in the images. I used Crisp Cantelope for the base and finished it off with a sentiment from Banner Blast that was perfectly cropped using the Banner Framelits and behind it I layered another cropped banner in Crisp Cantelope. This special card called for a matching re-purposed envelope. After trimming a few pages from the Sale-A-Bration flyer, I pulled out my trusty Envelope Board and created a one-of-a-kind envelope that compliments the card and will create quite a stir at the post office! All I need to do is add an address label and this cheery card is off to make someone's day. I hope the Pal's Blog Hop inspires you to rethink the way you look at your trash - look again, it may be your treasure! To purchase any Stampin' Up! treasures, click here. 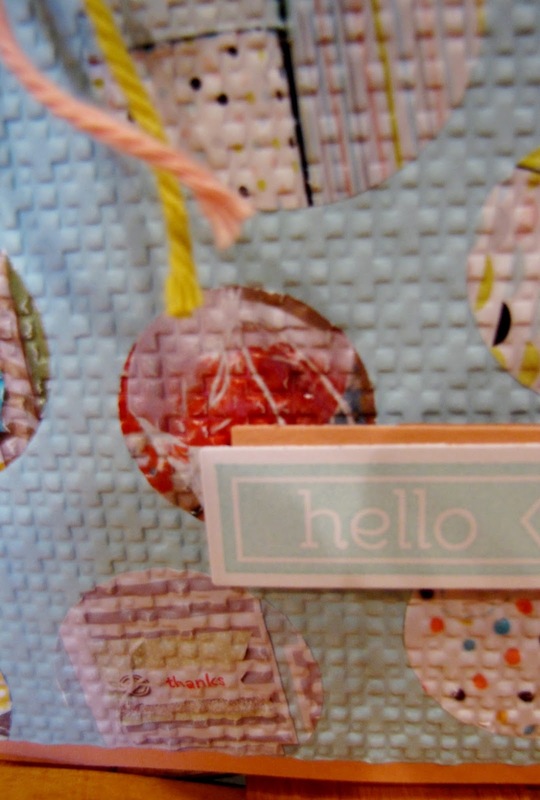 The next stop is #2, Debra Simonis at Deb's Stampin' Grounds on the Pals Blog Hop! Thanks for visiting and I hope to see you next month. Great idea to use the flyer. Your card turned out wonderful. Sue, your card has inspired me NOT to throw those brochures away. Surely I can find another purpose for them as you did! Great card!! Great idea! I have a stack of those left. What a darling idea! Plus it's a great way to use up the old catalogs! I love this! Fantastic idea, Sue!! I always save a few, but now know what to do with the rest! Love the added texture!! Sue, this has got to be the perfect recycling project. Nice job! And I love your phrase "Let it go!" What a cool idea! I just tossed a bunch of those into the trash... Now, you have me digging through the trash!! Good things it's only stamping scraps! How fun and very clever! Your card turned out really cute, Sue. Very nice card indeed. I have most of the products listed. Now just have to put them together! Thank you for sharing! WOW - what a great idea using the SAB Catalog...brilliant!